The Dodge Viper Is Alive! We were the first to report the Dodge Viper was dead before Chrysler actually killed it. Now, like a zombie from a time before fuel economy, it's back. That's right, Chrysler's telling us today the Dodge Viper will live on! 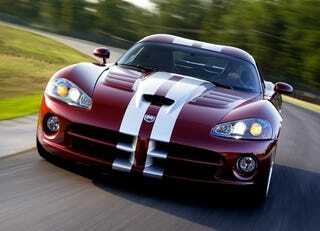 That's right, Chrysler's announced today production will continue on the legendary Dodge Viper SRT10. The automaker, which is also back from the dead, will also shelve plans to sell the Viper program. Here's the full press release with all the details. Auburn Hills, Mich., Jul 10, 2009 - Chrysler Group LLC announced today that production will continue for the legendary Dodge Viper SRT10. Originally slated to cease production in December 2009, the Chrysler Group Conner Avenue Assembly Plant - the exclusive home of Dodge Viper production since 1995 - will continue to build the V-10 powered sports car. Chrysler Group is no longer pursuing a sale of the Viper business assets. "The Dodge Viper has successfully captured the hearts and imagination of performance enthusiasts around the globe," said Mike Accavitti, President and Chief Executive Officer, Dodge Brand. "We're extremely proud that the ultimate American-built sports car with its world-class performance will live on as the iconic image leader for the Dodge brand." In May 1990, after months of intensive study and testing, Chrysler Corporation announced that the Dodge Viper, powered by an aluminum V-10 was a "go." Chrysler Group LLC, formed in 2009 from a global strategic alliance with Fiat Group, produces Chrysler, Jeep®, Dodge, Mopar® and Global Electric Motors (GEM) brand vehicles and products. With the resources, technology and worldwide distribution network required to compete on a global scale, the alliance builds on Chrysler's culture of innovation – first established by Walter P. Chrysler in 1925 – and Fiat's complementary technology – from a company whose heritage dates back to 1899. Headquartered in Auburn Hills, Mich., Chrysler Group LLC's product lineup features some of the world's most recognizable vehicles, including the Chrysler 300, Jeep Wrangler and Dodge Ram. Fiat will contribute world-class technology, platforms and powertrains for small- and medium-sized cars, allowing Chrysler Group to offer an expanded product line including environmentally friendly vehicles. With a work-hard, play-hard attitude, the Dodge brand continues to offer a full line of cars, trucks, SUVs, commercial vehicles and a sales-leading, fifth-generation minivan in 2009. Dodge will soon add to its award-winning Ram lineup with the introduction of its all-new 2010 Dodge Ram 2500 and 3500 Heavy Duty trucks. Dodge introduced several new vehicles last year, including the all-new 2009 Dodge Journey, the 2009 Dodge Challenger and the 2009 Dodge Ram. Dodge also celebrated the 25th anniversary of the minivan during the 2009 model year. With more than 65 minivan-firsts introduced since 1983 and more than 12 million Dodge and Chrysler minivans sold, Chrysler Group LLC has solidified its leadership in the segment. The 2009 Dodge Grand Caravan continues to set the mark in minivan value with more than 40 new or improved features from the previous generation, including unsurpassed 17 city / 25 highway mpg fuel economy. The 2009 Dodge Grand Caravan is also the first minivan in the segment to feature the all-new Blind-Spot Monitoring and Rear Cross Path advance safety systems. Also in 2008, the Dodge Journey entered key volume markets outside North America, joining the Dodge Avenger, Nitro and Caliber. Dodge Caliber was the highest sales volume vehicle for the company outside North America in 2008.